The first volleyball game will be on Tuesday at 5:30 p.m. in Herlong. Assistant coach Elizabeth Elorza said that the team is doing well. She said that earlier in the season she and the head coach had been weighing if there should be one or two teams. Head coach Judy Guidotti said, however, that they had decided to combine the teams and would finalize the details with athletic director Katie Campbell and principal Marla Stock. Elorza said that the players on the team need to commit to the team so they can start putting players in the positions where they are needed. Principal Marla Stock said that sports are positive and encourage the students to be active and keep their grades up. “They keep the kids physically active and improve their mental abilities,” she said. Head coach Judy Guidotti said the girls are prepared for a good game against Herlong. “They are looking forward to the challenge,” Guidotti said. The Loyalton volleyball team has a 14-game schedule this year, with six games at home and lots of travel time–to Providence, Elk Creek, Westwood, and Core Butte. There are 12 girls on the team this year. The Grizzlies took two losses to start out the football season. 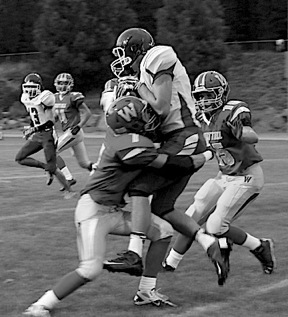 The Grizzlies lost to Whittell, 50-36, Aug. 29 in an away game in South Lake Tahoe. The Grizzlies played well in the first and second quarters but then became tired in the second half. The boys struggled with holding back the Warriors but managed to do so fairly well, putting quite a few points up on the scoreboard. Tyler Lake was the top scorer of this game with two touchdowns. Gus Driscoll was the best tackler of the game with 14 tackles overall and Andrew Kielak not far behind with 13. Lake and Parker Wilson obtained the most yardage of the game with Lake at 151 yards and Wilson at 155 yards. Although the Grizzlies lost, coach Brad Campbell, remained optimistic, saying they did well for the first game of the year and that they played hard the entire time. He also said the team would work on their defense for the next game. However the Grizzlies lost that game also to Big Valley, 38-6, Sept. 6 at home. The boys had a rough start to the game, but managed to hold the Cardinals in the final quarter. Parker Wilson was the top scorer of the game with one touchdown and Wilson obtained the most yardage as well with 181 yards. 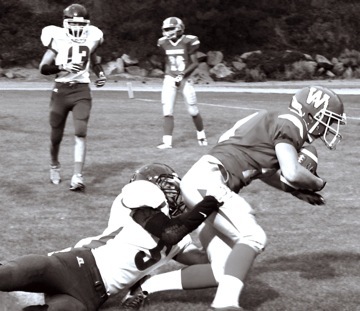 The best tackler of the game was Sam Beard with six tackles overall in the game. The Grizzlies will have their next home game tomorrow starting at 1 pm. The freshman retreat was held at the Grizzly Creek Resort near Beckworth last week. There were a lot of fun activities such as a ropes course, hiking and a bonfire. The freshman came back very tired on Wednesday because they had had two days packed with activities that were full of mentally challenging and physically challenging obstacles. Many of the freshman said that the retreat was a lot of fun. Most of their favorite parts were the ropes course activities. Caleb Bradley said that his favorite part was the flying squirrel. He also said that this trip helped him gain better leadership skills. He thinks that because of this trip, his class will not fight as much and will work together better. He thinks that the school should continue on with this trip because it gets the freshman out of school. Madeline Williams said she learned how to climb ropes and become a better leader. 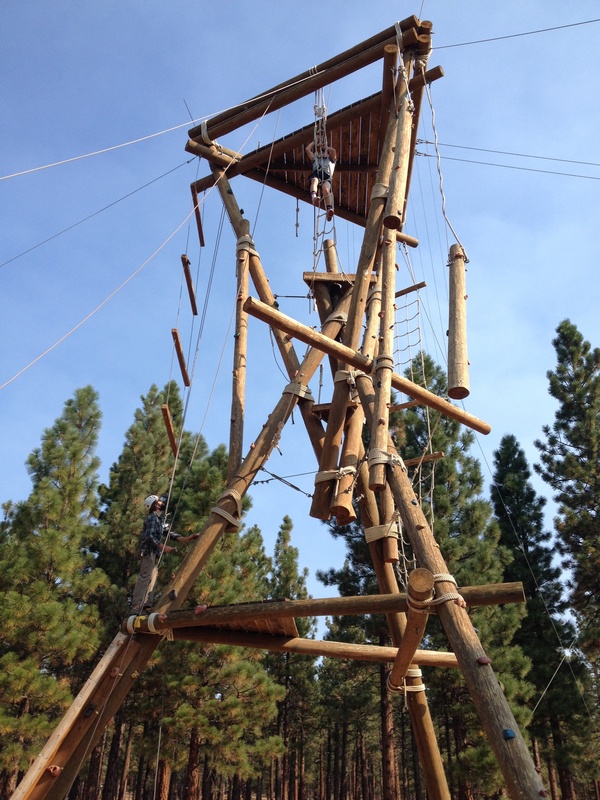 Her favorite part of the retreat was the alpine tower. She said that the skills she learned at the retreat will help work better with people. Williams said she thinks that the trip brought her class more closely together. She also thinks that she school should continue with this trip because it will help bond the class. 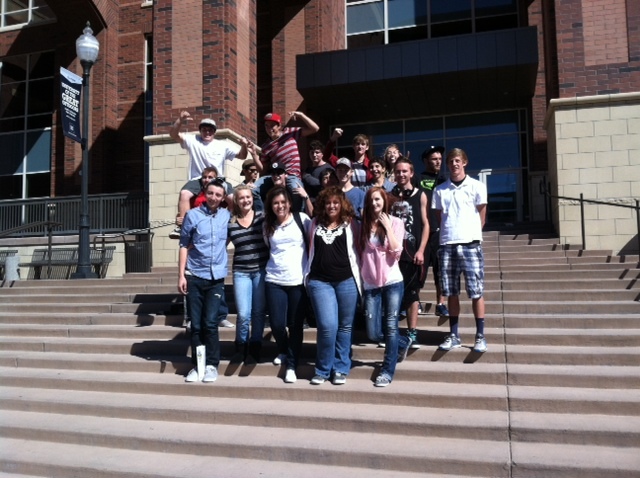 The trip was funded by the TRiO and Education Talent search programs at Feather River College in Quincy. These programs have been providing funding for events that will build leadership skills and confidence. It has only been three weeks since the end of summer break and already those sunny tans have faded from people’s skins, and students and teachers alike have settled into the flow of school life once more. For some, this means transitioning from elementary school to our combined junior high and high school. For others, this means becoming a freshman. And still others— we lucky few— become seniors. The graduating class of 2015 is fourteen strong and steady. The sixth-to-seventh-grade transition seems to be the most difficult transition to make. Current seventh graders were previously at the top of the totem pole, and now they have been thrust into an environment with new academic standards and kids up to six years older. The Buddy Connection was instrumental in easing the shift from elementary to junior high, as seen during the first day rally, when seniors were grouped with new seventh graders to participate in activities and ice breakers. Students played the Name Game and even acted out several things that they liked. The seventh graders were later taken on a tour of the school by three upperclassmen. One group of students who did not get shown around this year were the freshmen, usually the recipients of Loyalton High’s guided tour. Sadly— or thankfully, depending on how you look at it— the freshmen’s transition this year has been anti-climactic. With a year of experience in LHS’s halls, classes with its teachers, and dealings with older students, this year’s freshmen have an extra ounce of confidence in navigating high school life. Still, to ease the transition and build the bond within the class, the freshmen went on a two-day retreat this week, where they played games and learned general leadership skills. One day they will be the leaders of the school, so it’s good that they’re getting a head start. Maybe one of the most underrated transitions is that from junior year to senior year. The whole thing is bittersweet. The bitter: knowing all the work and obstacles you’re going to face the upcoming year, along with the idea of becoming an adult and being legally responsible for yourself. Ahh! The sweet: being at the height of the school’s pyramid, being confident with that years-in-the-making rapport with teachers, and being that much closer to leaving the public school system and Common Core behind. Honestly, adjusting to senior life hasn’t taken all three weeks. It really only took one morning. It took waking up at 5:15 a.m., Aug. 25, and riding to Senior Sunrise at Lauren Wangler’s house. It took sitting there with my classmates with the smell of Andrew Kielak’s burnt egg hanging in the air for the epiphany that has made these weeks easier. Every one of us (fourteen strong!) is in this together. The struggles of senior year haven’t entirely sunken in yet. Things are deceptively simple right now, and the stress is more like an ominous storm cloud on the horizon. At least I know that there are thirteen other people with whom to cry about things like lost flash drives and missed deadlines. The Sierra Schools Foundation’s second annual Sierra Valley Gran Fondo will take place here in the Sierra Valley on Sunday. The Gran Fondo is a cycling race; however, it has evolved into something more. At the Loyalton City Park an Expo of live music, bounce houses, face painting, petting zoo and fun for the entire family will be available. Vendors will also be coming to sell various crafts and foods, including the Loyalton Rotary Club. Expo organizer Janet McHenry, who is a board member for the Sierra Schools Founation, said that the Expo was named the Fall Family Festival this year, because the foundation also hopes that the community will come out and celebrate the fall season and welcome the cyclists, who are coming from all parts of the West Coast for the cyling event. One important fundraiser at the Expo will specifically benefit Loyalton High’s Future Farmers of America chapter – a horseshoe tournament. Signups for the contest are at 10 a.m., with the tournament starting at 11 a.m. FFA will net $10 from each entry. Winners will share the remaining money from entry fees. This Gran Fondo event is not just a fun time; its purpose is to raise money for the Sierra Schools Foundation, a group that helps support the public schools of Sierra County and the Sierra-Plumas Unified School District (SPJUSD). Due to SPJUSD’s rural location and lack of local economic resources, the Sierra Schools Foundation has three yearly fundraisers to help the schools. The other fundraisers are the Wellness Day and a golf tournament. The cycling event makes money in various ways: vendors who pay to have a spot to sell their items, cyclists who pay to participate in the race and sponsors who donate money to the cause. There are four races in which one can partake: the Piccolo Fondo, 33 miles, $50; the Medio Fondo, 66 miles, $65; the Gran Fondo, 96 miles, $100; and the Mega Fondo, 160 miles, $120. The goal is to have 300 racers; however, 100 to 200 are expected. The Sierra Schools Foundation’s board members are optimistic especially since better weather than last year’s event is expected. Two major improvements happened at the school during the summer. The school parking lot was repaved, and a small section for the buses was graded and graveled in preparation for the new busing program. The companies that paved the parking lots were McCuen Construction and Advanced Asphalt. The parking lot took at least five weeks to complete. When the pavement was repaved, it was also repainted with new parking lines and crosswalks. One of the people who worked on the parking lot all summer was Roger Boren. The buses are now parked next to the library in front of the agriculture garden. Sierra Plumas Joint Unified school district did not renew a contract with White’s Transportation for bus service last spring and took over management of the school bus service, leasing buses from Plumas Unified School District. The drivers spent several weeks with a trainer and the Highway Patrol to learn how to properly drive the bus–a lengthy and complicated process for the bus drivers to complete. The bus drivers are now school employees–maintenance men Toribio Ramirez, Richard Jaquez and Mike Hale. There is one substitute from Plumas Unified who is helping out. The buses each take one route to three different places–Chilcoot, Sierra Brooks and Calpine/Sierraville. The LHS office has been informed that the district office will be more strict about checking bus passes for riders. Some bus riders have said that they like the new buses –that they have more space and are much more comfortable. Those interviewed said they like the new smooth asphalt and bus parking lot because it provides a smoother ride when the buses pull into the school, because the new asphalt is easier to drive on. Some of the buses have run a little bit behind on finding the right route, as drivers are still learning their routes. Please select a link from above. Thank you for your support!